Merry Christmas and Happy New Year from Vanuatu! I hope everyone had a fantastic day with friends and family. I spent my Christmas with my colleague Jess, on Iririki Island – the staff there put on an amazing lunch which we then followed with some of the best snorkelling I have seen in my time here. I spent Christmas Eve singing carols with this cheeky guy and his friends and family. 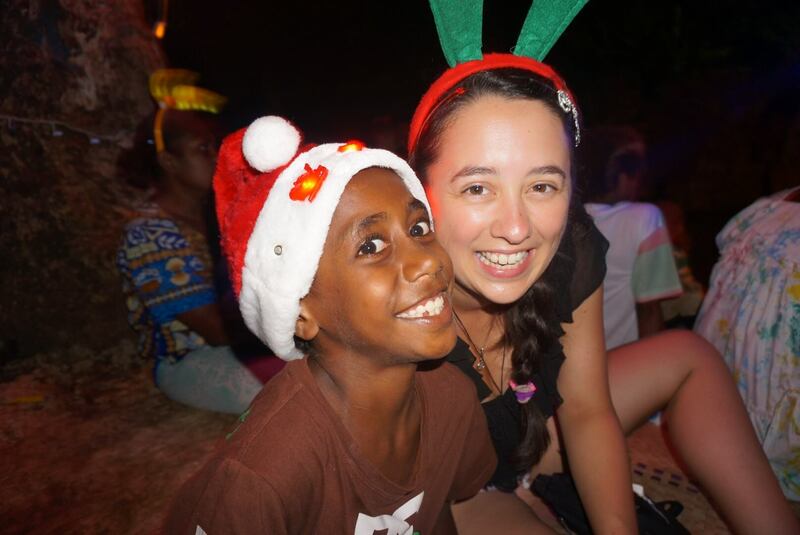 Jess also had the brilliant idea of playing a movie for the sick pikinini’s (children in Bislama) who were stuck in hospital for Christmas. It took some major organising but eventually we managed to screen Elf, which the parents and children really enjoyed. It was especially great to see the parents get some time off while the children were distracted with the movie. As you may have gathered from the above, I have spent the last two weeks on the Paediatric ward. The teaching on this ward is excellent and there are so many ways we can help out, making this one of the most rewarding placements I have been on in my medical schooling. To begin the morning, we help out with the ward round, taking notes and filling out forms before heading to the maternity ward to perform baby checks. Then we meet up with the doctors in the nursery (a very simply resourced neonatal ICU) to see if they need any help before heading back to the ward to make sure the jobs laid out from the ward round are carried out. It is also our responsibility to follow up on any lab results at the lab (which is one of the best places to hang out as it’s in the new building and has air conditioning). 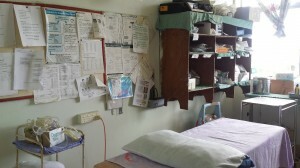 Treatment room on the Paed’s ward. Signposted as the Emergency Room but mostly used to take bloods. There is also always a clinic going on; in the children’s outpatient department, there is a primary health clinic, run by two or three nurses, and the ward always has children coming in for follow-up after discharge. And when all of that is done, we sneak off to play with the kids! Jess is a huge fan of this particular past-time – one of the Mums even offered to teach us some Bislama after Jess played with her child! The first week on the Paed’s service had its ups and downs but the one constant was the children. It’s been amazing to spend time with these kids and see the changes in their personalities as they get better. Jess admitted one child with glomerulonephritis who screamed the entire time she examined him that first day. As time went on and he got better, we managed to get him to smile more and more until he was happy to let us examine him.It was at this point that we knew he was better and he was discharged from hospital. We even got a laugh out of him a few days later in clinic! Things like this really reinforced the first lesson I learned in Paediatrics back in Greymouth – sick children are not themselves and a change in character can be a sign of serious illness. Unfortunately, as is the case in any Paediatric service, it can’t all be fun and games. There is one 22 month old child on the ward at the moment with suspected acute lymphoblastic leukaemia (ALL). The doctors here are unable to confirm the diagnosis as they cannot do bone marrow biopsies, nor are they able to treat the condition as they don’t have the medications. They have based their suspicions on the child’s multiple admissions for difficult to treat chest infections as well as pancytopenia (twice requiring transfusion) and failure to thrive. Example of a sharps container on the Paed’s ward. It’s sad to think that a condition that can be easily treated at home has a 100% mortality rate here. It is especially sad when you spend two weeks getting to know a child with that condition, all the while wondering if this will be their last Christmas. I have found it very difficult to cope with this and am thankful that my amazing colleague Jess is looking for ways to help the children with suspected ALL. Something else we have noticed on the Paed’s ward (which no doubt applies to all the wards here), is the incredible overuse of antibiotics. It’s refreshing for me to be in a country that has so little antibiotic resistance but it is terrifying to think how quickly that will all change if the current practice is kept up. Perhaps a good example is the management of children admitted with gastroenteritis here. 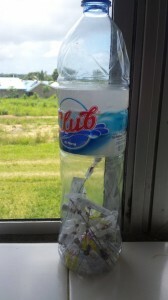 To begin with, many of these children don’t stay longer than two days as they aren’t usually that unwell (i.e. not dehydrated or in any distress). But while they are on the ward they are started on at least two antibiotics. Usually this is a combination of gentamicin and ceftriaxone. The current paediatrician here, hates coming in to find these medications charted – most gastroenteritis doesn’t need antibiotic treatment in the first place and even if these children did require it, these are the wrong antibiotics to use. For this specific situation, Jess and I were going to look at the current guidelines and maybe make some changes with the paediatrician’s approval. Obviously, antibiotic overuse is not limited to gastroenteritis in children though. I have yet to see a patient be on one antibiotic at a time. Usually they are on two, if not three and will remain that way for at least five days before going home on one antibiotic for perhaps another week if they were particularly unwell. Completely overhauling the system of antibiotic use here would take more time and knowledge than I currently have but maybe by changing one aspect (gastroenteritis management), we can get people to look harder at the others. 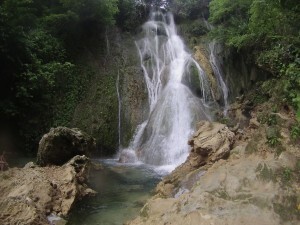 The amazing Mele Cascade Falls – a must-see if you ever visit Vanuatu. I know I said this in my last blog, but I can’t believe how fast my time here has gone by! Five weeks ago I was overwhelmed by the sights and smells of this foreign place and now that I finally feel at home here, I have to leave it all behind. There are so many things I have learnt from my experience here and I look forward to writing a final blog reflecting on these after I return to Grey Base Hospital in early January.